BLAGOLAZH National Meeting of Joke- and Storytellers is held in May every odd-numbered year as part of the International Biennial of Humour and Satire in the Arts. It aims to reveal the wealth of Bulgarian comic prose foklore; to enable and encourage storytellers from all over the country and Bulgarians living abroad to demonstrate their storytelling skills and talent. BLAGOLAZH is also the result of the interest in Gabrovo humour, its exploration, collection and study. The first National Meeting happened on May 20th, 1985, but the auspicious ground for it was prepared as early as 1975 when an Ethnology & Folklore department was set up at the House of Humour and Satire. One of the focuses in the department's work was the tracing-down and collecting of comic verbal foklore - jokes, anecdotes, fables, etc. 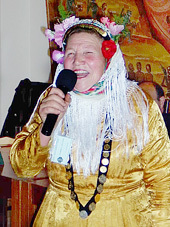 And though the then political regime in Bulgaria did not presume the free telling of jokes and anecdotes, in 1979, during the national humour festival in Gabrovo, journalist and host to foklore programmes on Bulgarian Television and Nulgarian Radio Rumyana Tsintsarska managed to hold an off-the-cuff storytelling competition with some amateur performers who had come to participate in the Festival of Amateur Art Activities. Then in 1981 the extensive field work done by Ethnography & Folkore department resulted in the publication of a lot of scientific papers and collections of comic folklore. Meetings of storytellers from villages and towns nearby Gabrovo were held in 1982, 1983 and 1984. The formal regulations of BLAGOLAZH National Meeting were drawn up by Ethnography & Foklore department in 1984, and in 1985 they were approved by the then Committee on Culture. A month prior to the of the First National Meeting, the House of Humour and Satire hosted a joke-telling marathon on April 1st, 1985. The marathon was joined by joke-tellers from Gabrovo and representatives of the humour clubs in Bulgaria. It is the First Meeting in 1985 that opened the chronology of BLAGOLAZH. It was designed by Bulgarian Television and Bulgarian Radio journalists Rumyana Tsintsarska and Katya Vodenicharova along with Humour, Satire and Fun radio programme that recorded and broadcast the entire event. At the suggestion of folkorist Moysey Moyseev, who worked for the H ouse in the 1980s, the competition was named BLAGOLAZH after a character in the short story Mowers by Bulgarian author Elin Pelin. BLAGOLAZH prize - a small wooden sculpture with a copper bell to it - was designed and done by artist Petko Andreev, another member of the House's team. Sixteen editions of the National Meeting were held from 1985 until 2015. Over the years, co-organizers of the event have been: the Institute of Folklore to the Bulgarian Academy of Sciences, the Committee on Television and Radio, the Centre for Amateur Art Activities to the Committee on Culture, Training Centre for Foreigners in Gabrovo, National Endowment Fund 13 Centuries of Bulgaria - Gabrovo branch, the Ministry of Culture, the Ministry of Public Health, editorial boards of national dailies and magazines, St.St. Cyril and Methodius Univeristy of Veliko Tarnovo, the National Association of Hunters and Fishermen in Bulgaria, the State Agency for the Bulgarians abroad, Bulgarian National Radio and Gabrovo companies. BLAGOLAZH prizewinners have been : YORDAN TODOROV(1985), ASEN IGNATOV(1987), TANYA BIKARSKA(1989), DIMITAR DIMITROV(1991), FLORA YURUKOVA(1993), VESELINA BABADZHANKOVA(1995), YORDAN CHUHOVSKI(1997), NIKOLAY DOINOV(1999), ASPARUH YORDANOV(2001), TOROS KIREMIDZHIYAN(2003), NIKOLA IVANOV(2005), MARIA MARKOVA(2007)and ELENA STOEVA(2009), DESHKA STEFANOVA (2011), GEORGI PETKOV (2013), ORLIN KISYOV (2015), RUSKA GEORGIEVA DROSEVA (2017). 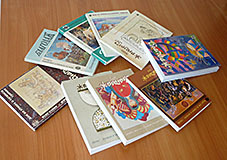 The best of the 17 editions of BLAGOLAZH National Meeting is contained in 9 booklets from the BLAGOLAZH series published by the Museum HOUSE OF HUMOUR AND SATIRE.